How to drive a HFBR-1541 optical transmitter? I want to drive a HFBR-1541 optical transmitter (see page 7; 60mA output current), and I want the driver to have extended operating temperature range (at least starting from -20 degrees Celsius). The driver recommended in the datasheet, SN75451, does not meet the extended operating temperature range requirement and its corresponding version, SN55451, is not produced any more. Can somebody suggest a circuit or schematic to drive this transmitter and meet the operating temperature range requirement. Three outputs were combined to share the load current. C65 was a speed-up capacitor. This was running at a data rate of tens of Mbps. Not the answer you're looking for? Browse other questions tagged driver transmitter optical-fibre or ask your own question. 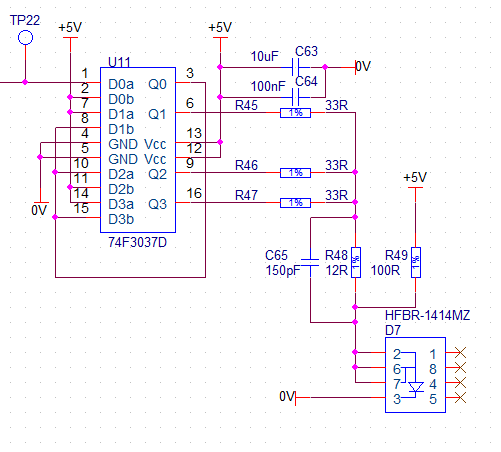 Driving 50W-250W ultrasonic transducers with sine: Any Class B 135KHz monolithic power amp ICs? What grade of fibre is used in optical fibre displays? How would I measure distance with a transmitter/receiver pair? How can I make an optical circulator?